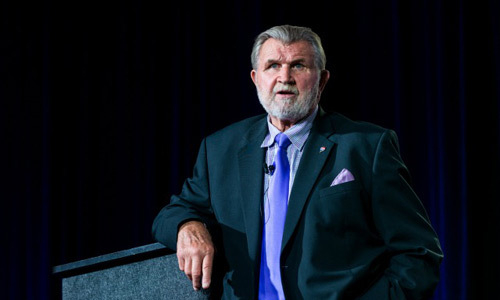 To celebrate the opening of the 2016-17 NFL season this evening…here are some game-changing insights from Hall of Famer Mike Ditka’s presentation which closed the 2016 RE/MAX Broker-Owner Convention in Chicago August 2016. When you’ve reached the pinnacle of your profession, coaching and working alongside some of the greatest players in your field, you learn a bit about leadership and teamwork along the way. So there’s no doubt that NFL Hall of Famer Mike Ditka knows his stuff. Although life is an individual journey, he says, having the right people pushing you and holding you accountable along the way makes all the difference. The 2016 BOC officially came to a close on Tuesday, but not before the Super Bowl-winning coach took the stage. The outspoken Ditka spoke of his humble beginnings, the importance of hard work and the undeniable value of building the right team. From “Da Coach” himself, here are top pieces of advice for life both on and off the field.